Anyway, if you want to visualize the result, you can download the file here. Did you try with all these software: http://pdfreaders.org/index.it.html? Yes, with the exception of Vindaloo and Sumatra PDF, of course. But i did it some months ago, maybe something changed in the meantime (or i missed something), so if you want to try again would be nice (it is always better a double check). I will send you soon the data to try. Ciao. 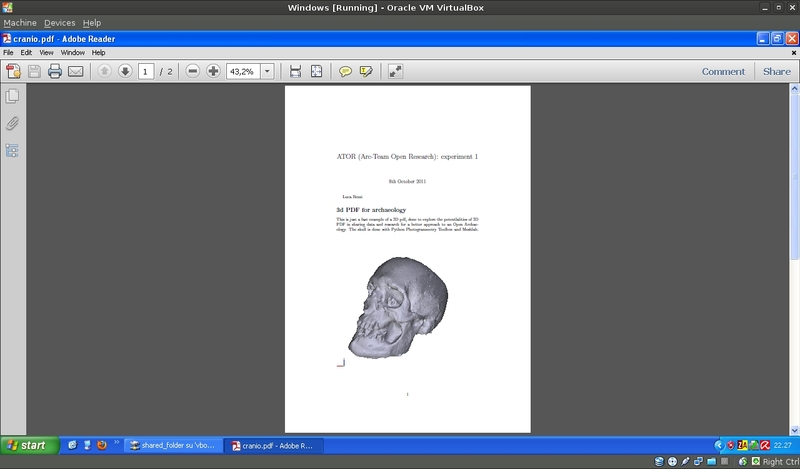 Anyway, to start to try with the pdf readers, you can just download the 3d pdf from the link in the post. If you want to do some more experiments with the Latex code, i will write soon a new post and upload the tex and the u3d file. Ciao. Apparently Movie 15 LaTeX package can only be read by Adobe Acrobat Reader. This package looks very promising. 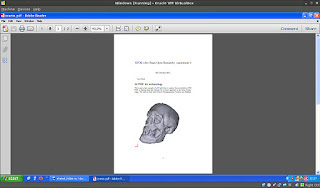 3D models and video content can be very useful in archaeological pdf papers. I'm doing similar research here in Canada. Has anyone found an open GL viewer that is web based? I have found that the latest version of Acrobat still does not fully integrate texture maps and I was hoping to by-pass this completely by allowing researchers to upload files to a web based GL viewer instead.